There was only one teenager (Michele Borassi) who won an EGP title. Three players in their fourties have won the title. 5 players have won their first tournament in their teens, while 6 players have won a tournament after turning 40. Imre Leader and Marc Tastet are the "Abrahams" who managed to win a stage after turning 50. There are 22 occasions where a player won 2 tournaments within a period of 10 weeks (70 days). There are even 3 players who managed to win 3 tournaments within a period of 100 days. 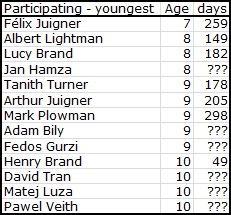 Arthur Juigner is the youngest player to reach the final of an European Grand Prix tournament, while Marc Tastet is the oldest. A special prize goes to Ian Turner, who is by far the oldest player to play his first final. Arthur Juigner is the youngest player to step up the podium of an European Grand Prix tournament, while Marc Tastet is the oldest. Once again Ian Turner is by far the oldest player to grab his first podium spot. Arthur Juigner was also the youngest player to qualify for the play-off, while Marc Tastet is the oldest. Félix Juigner beat the record of his older brother with almost a year when he reached the top 10 in Paris 2015. Mikael Mårtenson has a very nice lead over Luigi Puzzo reaching the top 10 at older age. Magdalena Rogosz finished in the top 10 at the age of 16, while Eva Panagou achieved this at the age of 67. Félix Juigner is the first player under 8 to participate an European Grand Prix tournament. He managed to win 5 games in that tournament, which is quite remarkable for such a young participant. Lucy Brand is now the youngest girl to participate. Ken Stephenson is the oldest to participate, but who will be the first above 80? Luigi Puzzo is the oldest who has traveled abroad to participate an European Grand Prix tournament. Eva Panagou is the oldest women to participate an EGP tournament. The fastest player to cross the barrier of 1000 points is Takeshi Murakami. He needed only 7 tournaments to do so. The smallest time span to cross the barrier of 1000 points is 2 years and 38 days, achieved by Milosz Cupial. The longest time span to cross the barrier of 1000 points is 19 years and 53 days, achieved by Francesco Marconi. The slowest player to cross the barrier of 1000 points is Roman Kraczyk. He needed 54 tournaments to do so. The fastest player to cross the barrier of 2000 points is Michele Borassi. He needed only 15 tournaments to do so. The smallest time span to cross the barrier of 2000 points is 5 years and 266 days, achieved by Takuji Kashiwabara. The longest time span to cross the barrier of 2000 points is 27 years and 78 days, achieved by Francesco Marconi. The slowest player to cross the barrier of 2000 points is Dominique Penloup. He needed 41 tournaments to do so. The fastest player to cross the barrier of 3000 points is Imre Leader. He needed only 29 tournaments to do so. The smallest time span to cross the barrier of 3000 points is 6 years and 300 days, achieved by Takuji Kashiwabara. The longest time span to cross the barrier of 3000 points is 29 years and 131 days, achieved by Francesco Marconi. 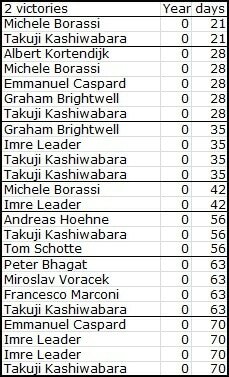 The slowest players to cross the barrier of 3000 points are Francesco Marconi and Emmanuel Caspard. They needed 43 tournaments to do so. The fastest player to cross the barrier of 5000 points is Imre Leader. He needed only 47 tournaments to do so. The smallest time span to cross the barrier of 5000 points is 9 years and 269 days, achieved by Takuji Kashiwabara. The longest time span to cross the barrier of 5000 points is 30 years and 18 days, achieved by Graham Brightwell. The slowest player to cross the barrier of 5000 points is Marc Tastet. He needed 77 tournaments to do so. The largest gap of age in a game between two players is 65 years and 248 days. Ken Stephenson won the game against youngster Luke Plowman at the Cambridge EGP 2014.